وظائف شاغرة في بنك دبي الإسلامي. To review and conduct an independent in-depth review and due diligence analysis of the Credit Proposals (CPs) received from Home Finance Department (HFD) & Real Estate Finance Department (REFD) by undertaking thorough evaluation & an in-depth analysis & ensuring compliance to DIB credit policies /Shari’ah principles/regulatory laws of UAE etc. for review & approval by the relevant approving authorities within the Bank, thereby contributing to maintaining a sound credit portfolio, hence, minimizing losses & maximizing return on assets & shareholders’ equity as well as depositors’ funds. جميع التفاصيل وطريقة التقديم من هنا. 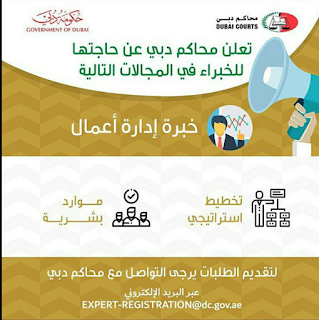 وظائف مندوب علاقات عامة في الامارات ٢٠١٩.